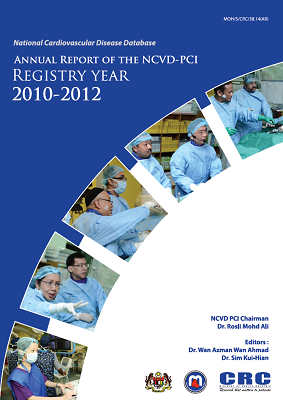 This is the 3rd report for the NCVD-PCI Registry accounting for the period from 2010-2012. This report gives us an opportunity to compare the baseline characteristics, presentation, lesion complexity, device use and clinical outcome between these two periods 2007-2009 and 2010-2012. The mean age for PCI remains approximately the same i.e. 57 years. Our PCI population is still younger than in the Western countries. Of concern 72% have three or more cardiovascular risk factors. Males still predominate females by 4:1. In this report, more procedures were for stable coronary artery disease (CAD) as compared to acute coronary syndrome (65.2% vs. 56.4%). This may not be a true reflection as some stable CAD cases were PCI for patients post AMI. The door to balloon time has remained the same with a median of 90 min but what appears troubling is the delay in transferring patients to a hospital with catheterization lab facilities (180 min in 2007-2009 vs. 220 min in 2010-2012). We continue to perform a high number of complex lesions (Type B2 and C lesions: 58.8% in 2007- 2009 vs. 61.6% in 2010-2012).The use of drug eluting stent (DES) has increased over the years from 53.0% to 64.0%, reflecting the change in practice and possibly due to reduced cost of DES. The procedural success rate remains high (96.8% vs. 95.3%). The mortality rate has continued to remain low both for in-hospital (1.8% vs. 1.1%) and 30-day outcome (1.7% vs. 2.3%), for the two periods 2007-2009 and 2010-2012. I would like to thank Prof Dr Wan Azman and his team for the excellent work undertaking the writing of this report, NCVD secretariat for managing the registry and to all the participating hospitals and their staff for sending in data. And I look forward to discussions that will be generated from this publication and future publications.